Go Rhino BR10.5 Winch-ready HD Front Bumper Replacements are laser measured and designed in 3D CAD to fit the contours of each vehicle. The bumper features a steel two-piece design that holds winches rated up to 16,500 pounds. Winch tray and mounting brackets are made from 1/4" steel. Features a hinged winch cover to be used with or without a winch. 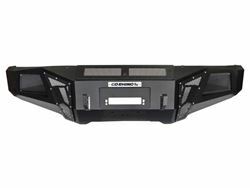 Includes integrated hidden front 2" receiver hitch mount. Patented heavy-duty Rhino hook D- ring shackle mounts (US Patent # 790,408) are mounted directly to frame rails for extra strength. Unique design includes integrated light ports for lighting customization with optional light plates and patented Light Mount Bar (US Patent # 757,316).